Developed in 2006 as a cross between Strisselspalt and Yeoman, Triskel contains many of the same characteristics as Strisselspalt but displays a more pronounced flavor profile. Specific aroma descriptors include strong floral, herbal, citrus and spicy. Styrian Golding is a hop variety with a confusing name because it doesn’t come from a Golding at all, but rather a Fuggle and has Fuggle-like characteristics. It was a major hops crop in the 1930s in its native Styria (in Austria on the Slovenia border), and has survived due to its tolerance to mildew which helped it to hold its own amid other varieties. It is now world-renowned and in high demand. It is a lovely aroma hop with high humulene and moderate myrcene and carophyllene. Even its farnesene, although low, makes its imprint on the aroma. The alpha acid content of hops will vary from batch to batch and may vary from the amount shown in the picture. 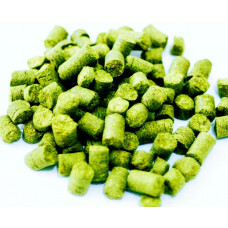 Huell Melon Hop Pellets (Germany) - Specific aroma descriptors include distinctive honeydew melon and strawberry. Lublin Hops is an aroma variety with an alpha acid rating of 3.0%-5.0%. Lublin is compared to the noble varieties, and has a long tradition in Polish brewing. It has very high farnesene oil content, which itself has hints of magnolia and lavender. As for Lublin hops, there is pride for its aroma in the region, and it has made its way around the world in various beers. Lublin was bred from Saaz and carries with it many of the same characteristics. Epic has been reported to give a very pleasant deep, fruity, berry-like aroma with hints of lemongrass. It is slightly herbal without citrus or floral notes. It makes an excellent main copper hop or as a late aroma hop. Strongly but pleasantly spicy with sweet, fruity overtones (citrus, red berries). Mild and approachable in the “noble hop” sense. Admiral hops have a relatively high alpha acid percentage making it useful as bittering agent in brewing. It has moderate myrcene and caryophyllene oil composition giving it a woody and herbal hoppy character, although it is not overbearing. Its contribution of higher amounts of humulene and farnesene add some fruit flavors to its profile such as citrus. A tangerine machine when used for late, whirlpool, and dry hop additions, Mandarina Bavaria is quickly finding support in the brewhouse for American IPA and variants, black ales, saisons, Brett fermentations, and other beers where a definite fruity and strongly hoppy character is beneficial. Intense pineapple, lemon and citrus flavors with a resinous, herbal followup. Sweet and distinctive. Spalt Hops is an aroma variety and has a low alpha acid content at 4.0%-5.0% with a 1:1 alpha beta ratio. This prolific variety is among the noble varieties due to its low co-humulone content and resembles Tettnanger. Spalt has abundance in all of the essential oils including farnesene which is barely traceable in many hop varieties. It is suitable throughout the boil and for dry-hopping German strongholds including Kolsch, Alts, Bocks.